Looking for some online side gigs you can do to earn extra money this month? We have a few ideas for you. Having the extra cash means you can pay off bills, plan a trip or make plans for a big ticket item. Whatever you need the money for, we have some pretty amazing ways to make money on the side that you can start right now. The idea is to find a few side gigs to make money and to also to find reputable work from home jobs. Before we get started on our top recommended online side gigs to make extra money, we did want you to follow us on Facebook for more awesome ideas on saving or making more money. You can also follow us on Instagram for more tips. 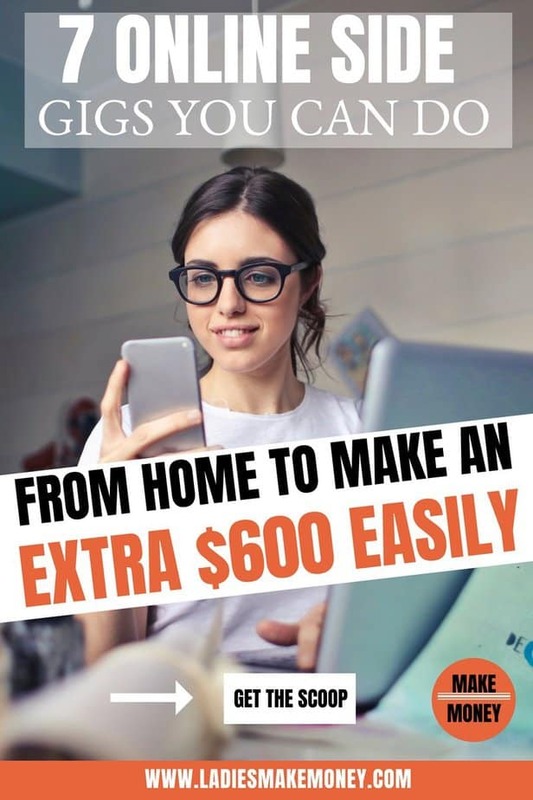 If you are actively looking for ways to make money on the side, then these online side gigs to make extra money are the ideal way to do so especially if you are looking to make $600 a month. Online side gigs or online side jobs as most people call them, is the perfect way to earn extra cash from home. This means that they can be flexible and can easily fit within your schedule. They are plenty of online side gigs available on the internet and sometimes sorting through them can be time-consuming. That’s why we put a healthy list of amazing online side jobs from home you can start today. Swagbucks is one of the best online side gigs available on the internet for many reasons. The main reason I love this company so much is that offer you multiple ways to make money with them. A few ways you can make money with Swagbucks is by watching cooking shows, getting paid to voice your opinion, getting paid to watch videos and you can also get paid to shop! PS, you can also earn free gift cards. This can be used to purchase gifts. As you can see its one of the best online side gigs out there that has lots of amazing ways for you to make money online. Sign up with Swagbucks to start earning and grab your $5.00 sign up bonus while are at it. With so many amazing online side gigs to make money that you can choose from, teaching English online can make you the most money. People are earning up too $2000 per month with this side job. It is definitely considered one of the best ways to make money on the side by many. They are a few places I would suggest signing up for this online side job. Joining these online side gigs can easily make you a full-time income while working from home. If you want to know how to make $2000 per month teaching English, be sure to read our last post. You can also apply to find tutoring online side gigs to increase the amount of money you make each month. Get yourself some extra cash using online surveys in your spare time. They are so many online side gigs available on the internet but finding the right online surveys can be tricky. Surveys such as SurveyRewadz pay out big money each year. You just need to be mindful when looking for ways to make money on the side using the internet. You are bound to come across a lot of scams or low paying online jobs. Be sure you are only signing up for the best possible job. I have earned over $500 with this one online survey and over $300.00 with SurveyMomma. You can find other high paying surveys here that you can use to make $600 a month with! Did you know you can make money online working from home by testing out websites? Companies are looking for individuals like you to test out websites. Get paid to give your opinion when you test out the different websites you are provided with. You will basically be grading how effective and user-friendly a website is. You are able to earn $10 for each website you test and try out. You can sign for UserTesting and start earning your first paycheck while working from home. They are a lot of big and small businesses looking for writers to write great content for them. Find writing jobs is so easy with Contena! Freelancers are currently making over $2000 per month and even more by finding writing online side gigs. Just see how this blogger from Let’s reach Success made over $1, 200 with Freelance writing. 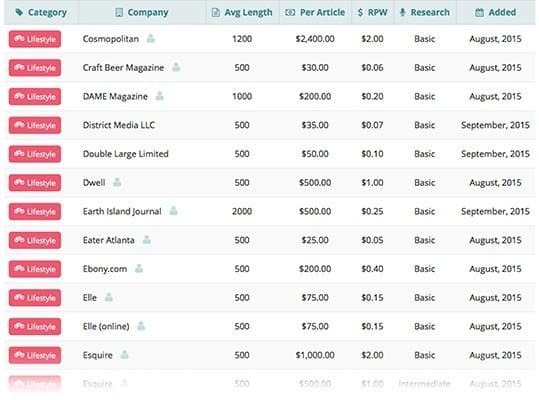 They are companies that pay over $250 per article and others that pay more than $1000 per article. It will depend on your experience, writing skills and more. This is one of the many trusted online side gigs available on the internet in today’s time to make extra money from home. With Contena, you can find clients that fit your schedule and fees which is perfect for busy people. Sign up today to start your freelance writing career. Out of all the high paying online side gigs we have mentioned today, this one can make you so much money. I personally know an Entrepreneur that made over $50, 000 blog flipping. Blog flipping is buying a Blog or building a blog, then selling it (flipping it) for a profit. It works just like house flipping. You can create a blog, build it up and sell it for a profit. If this is an online side job you want to pursue while working from home and make money, you can get more details here. Use code LADIESFLIPBLOGS to join the university today. If you would like more information about Flipping Blogs, you can read the full post. If you want to become a creative entrepreneur in your spare time and are looking for online side gigs to increase your monthly income, consider listing your services on Fiverr. Thousands of businesses are searching for individuals to complete time-consuming tasks so they can focus on the core side of there business. If you have something you can offer such as web design, technical support, editing services, marketing, graphic designs or any other services, consider listing them up on Fiverr. Check out other online side gigs on Fiverr and see if you can offer these services. Don’t forget to create a profile on Fiverr. Get paid to surf the net with Nielsen digital voice. Become a FREELANCE and find jobs on Fiverr. Did you like our list of online side gigs to make extra money? If so, we would love to hear from you in the comments below. Be sure to tell us about any other side jobs you might be currently doing. Find more ways to make extra money from home right here. Ready to start these Online Side Gigs? Comment below!